JUST LIKE A WEB STAR! The web stars have arrived and they’re ready for the big event. Dress code required: a sparkling outfit, sunglasses and the latest smartphone model, of course! A selfie before the great debut is a must: snap a picture, choose a filter, insert a catchy quote, pull from your hashtags stack and finally…you’re on line! And here we go: the influencers walk the red carpet, lit up by the photographers’ flashes, while their frenzied followers wait to shake their hands and ask for an autograph or a picture! This is the amazing world of the web stars, always ready to show the most magical moments of their lives through posts and stories, where emotions translate into emoticons, filters and comments! For the SS19, ST!NG Eyewear takes inspiration from an imaginary Walk of Fame of the most loved web stars, creating a collection where the eccentric and oversize shapes combine with unusual materials and a vintage touch. 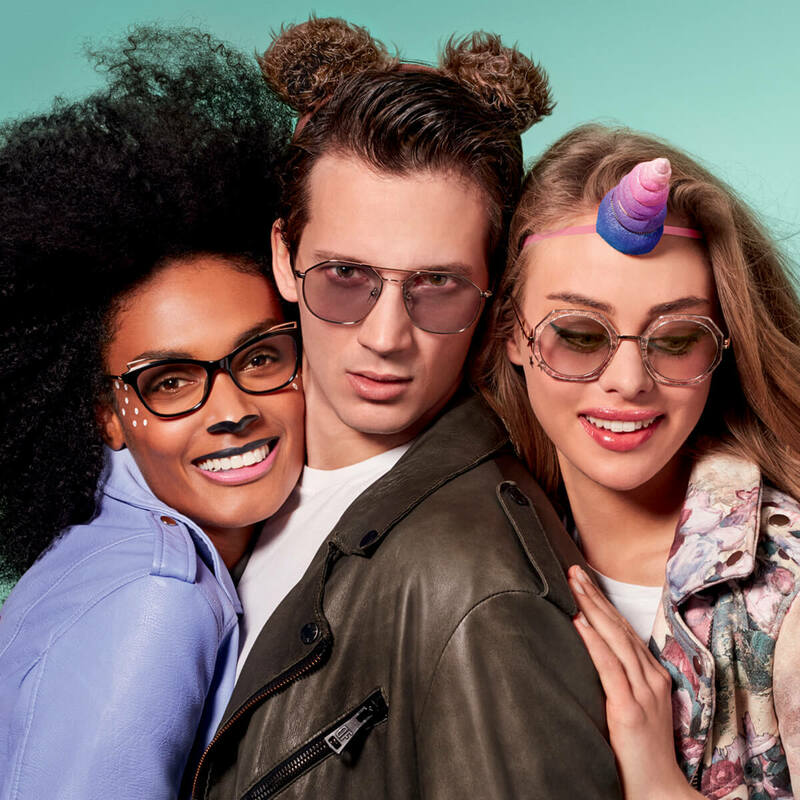 ST!NG Eyewear SS19 collection is perfect for those who want to be noticed, just like their favourite web stars! Love2 are the right sunglasses if you want to get lots of hearts on your social accounts! No one will resist the oversize shape with a flower micro-pattern decoration printed on the octagonal perimeter. Transparent rims and protective gradient lenses create a “double lens” effect that makes it original and quirky! Despite their size, these sunglasses are super light and comfortable, thanks to the very thin metal frame. Winning likes will be very easy with Trend7! These sunglasses are the new version of the iconic pilot: the vintage drop shape is updated through the geometrical upper side. The extra-light metal frame allows a very comfortable fitting and has a feather-light weight, which makes Trend7 a “24/7” accessory to wear from dawn to dusk. The pastel lenses make it a timeless piece, which is also available in the eyewear version. Fashion bloggers love a nice cat-eye! ST!NG EYEWEAR’s version of the feminine style “par excellance” is rendered in an acetate frame, adorned with two upper golden metal wings that accentuate its femme-fatale vibe. This decoration creates a funny game of full and empty spaces and gives the glasses a touch of unusual romanticism. It is perfect for all the girls who want to feel like web vamps! This is the ideal pair of glasses for digital natives: a new generation of intellectuals who never go out without their e-books and a pair of pilot glasses by ST!NG Eyewear. The SS19 version combines golden metal with plastic and ombre clear lenses: this is the ideal accessory to make a fierce and elegant look. The retro-style design is enriched with ultra-modern details, such as the bar on the lower bridge and the three-layer acetate temples. Are you ready for an all-day-long live streaming on your social platform, with your Content1 sunglasses? They’re the right accessory to wear from morning to night, because it is easy to transform them from specs to sunglasses, thanks to the magnetic clip-on. The rounded shaped metal frame and the temples – made of an elastic, light and resistant material called ultem – make them suitable both for him and her. These glasses give a nice touch of vanity to the little girls who already feel like social divas, thanks to the funny cat-eye shape! Colorful and lively, Emoji1 are comfortable and light. The frame with its thin metal profiles and the three-layer acetate temples make these glasses resistant and suitable to be worn all day long. Emoji1 is the eyewear for aspiring baby geeks, already experts in juggling bits and pixels! The round-shaped frame, particularly suitable for the children faces, is made of ultra-thin metal, with three-layer acetate temples. Comfortable and light, Emoji1 are designed for an extended use and a total comfort, both at school or during leisure time.